If you missed, Microsoft released the IE9 Platform Preview for developers and webmasters in March this year, to test IE9 with their contents. The latest is 4th one, released last week. Over 2.5Million already downloaded. Make sure you do that. To solve the problem of limited space at event, of course excluding VIPs, all invites will contain a link to the official HTML5 website, you can see the video. Invitees have to complete a word puzzle by typing the letters as shown on the screen. Unlock the _ _ _ _ _ _ web. The valid letters are V E A N T I with a single word answer. Still couldn't guess the answer? It's NATIVE. The following RSVP button appears as the puzzle is completed and you are approved for the event. 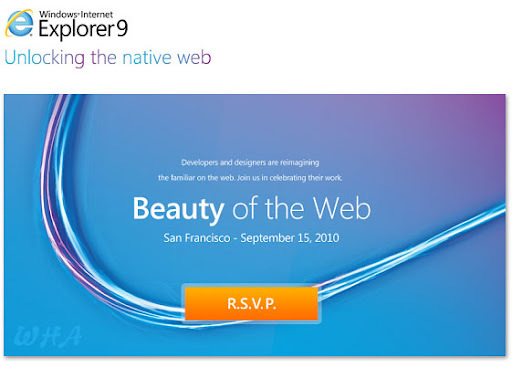 So friends do check your inbox right now for any invites you got :D Developers have worked a lot for improvements in IE9 as it's clearly visible in the previews - Full HTML5 support, CSS3, SVG rendering and more. We are going to see many cool features. What do you expect from IE9? Do you still worry about the security? Share your views because, the comment box is yours. Very informative post. I was looking for this information long time. I like to forward this to my friend.